When you take all the mistakes you made on your first feature film, then amplify those mistakes with a larger budget on your next feature film, you end up with this cinematic turd. 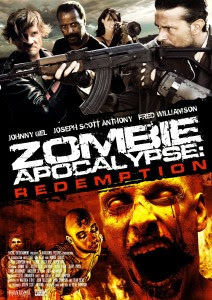 Zombie Apocalypse: Redemption deals with a group of survivors leftover from films like Mad Max, The Warriors, and Doomsday who struggle with themselves and an occasional zombie set in a post apocalyptic landscape (greater Michigan). Writer/director Ryan Thompson (whose film Zombie Apocalypse we previously flushed HERE) didn't leave well enough alone the first time around and decided to torture us some more with this crazy nonsense. This cinematic bowl floater is currently available for streaming on Netflix, VUDU, and Amazon Instant Video, but for safety (and sanity) reasons, please listen to this podcast first. We only want to help. Our special guest this time out is Alicia Deven Clark, who plays the lead character Sarah. This Michigan based actress has appeared in various commercials, shorts, and features, none of which is nearly as unforgettable as her master class performance in this turd, clad in a flea market version of a Slave Leia outfit.